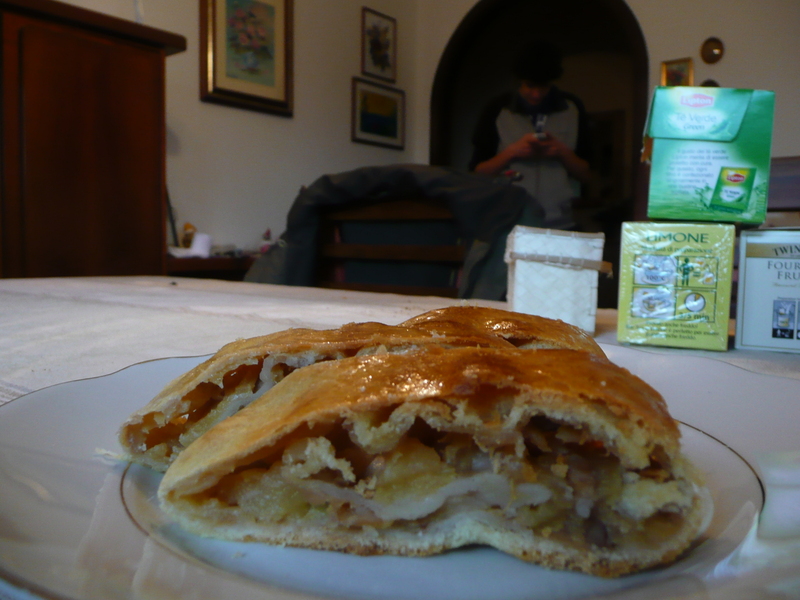 Bionda (custard pastry), and the only thing so far that I’ve eaten out (there really is no need to go to restaurants, Roberta is an incredible cook!). Well it’s the 24th December here, and even though there’s no snow, it does feel like Christmas! Roberta (Patrick’s Mum) is making my new favourite biscotti in the kitchen (she’s teaching me so I can mass produce them at home!!!) and yesterday Patrick and I decorated the (real) Christmas tree! Tonight we’re going to a Christmas service at the local church, which will be a first for me. In the meantime (have to wait until 12am for the service), here’s what’s been going on! 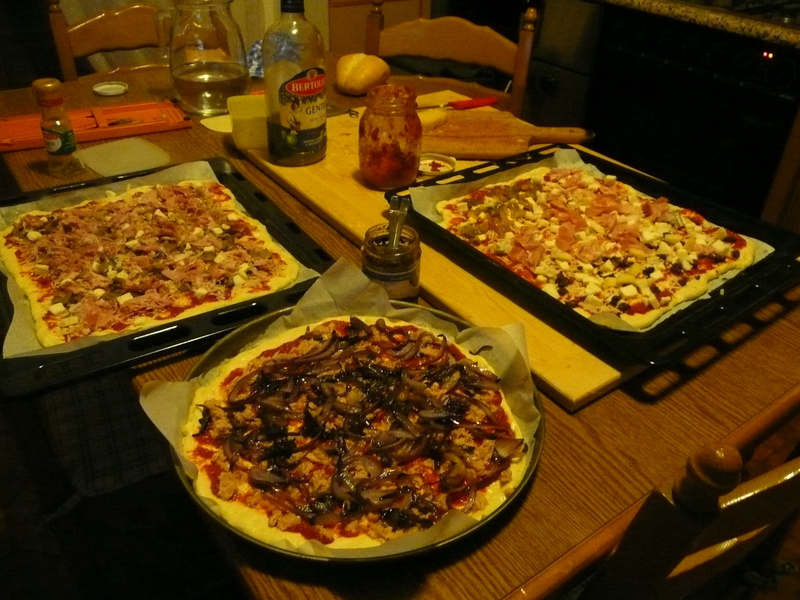 On Wednesday night we made pizza for dinner (YUM), and Patrick and I helped Roberta with the toppings (we made 3 – tuna and onion, proscuitto and mushroom, and gorganzola and olive paste). 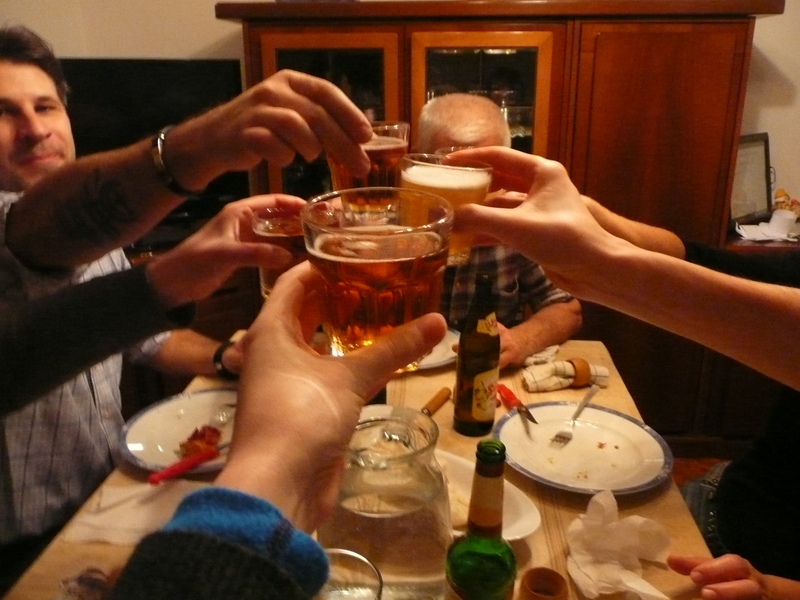 Katrin and Bruno came around for dinner and we tried different beers from Austria and Italy. 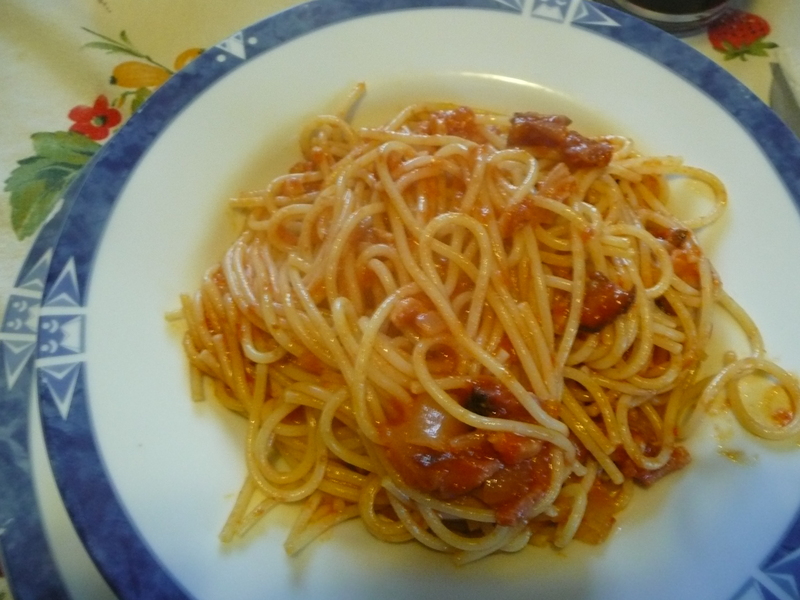 It was really nice and I felt so at home with everyone laughing and joking. Bruno, Katrin and Patrick provided joint translations for me so that I was included in the conversation. I love the way that the family is the centre of life here, and that everything important seems to happen around the kitchen table. Yesterday, after a failed attempt on Wednesday, we went to see the bell of Rovereto, which is the largest working bell in the world. 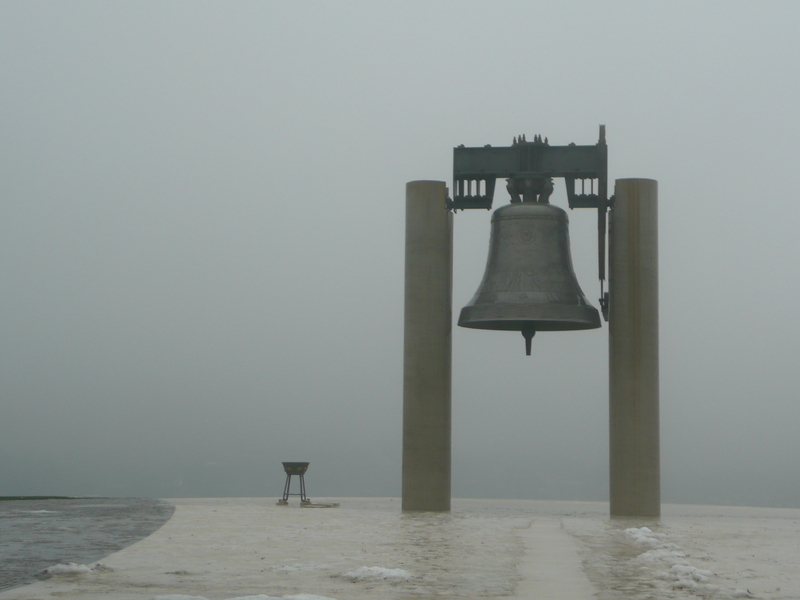 It was made from the canons of World War One melted down in a wish for peace. The weather has been a bit uncooperative (it has rained every day since I arrived,), so you couldn’t see the town through the clouds, but Patrick assures me that it’s there! We then went to meet Valentina at the Mart (Modern Art Museum) which seems to be famous across the country for its architecture. Valentina’s Dad is somehow involved with the gallery (Patrick jokes that he’s the boss) so we got in for free and saw a exhibition of sculpted, angular heads by an Italian artist who worked in Paris. I still find it hard to appreciate modern art, but it was good to look around before browsing in town a bit and going home for dinner. After dinner, Patrick, Valentina and I went to the local pub for a drink and to play Jenga. Patrick is quite daring so he ended up toppling the tower the most times, but we had fun. 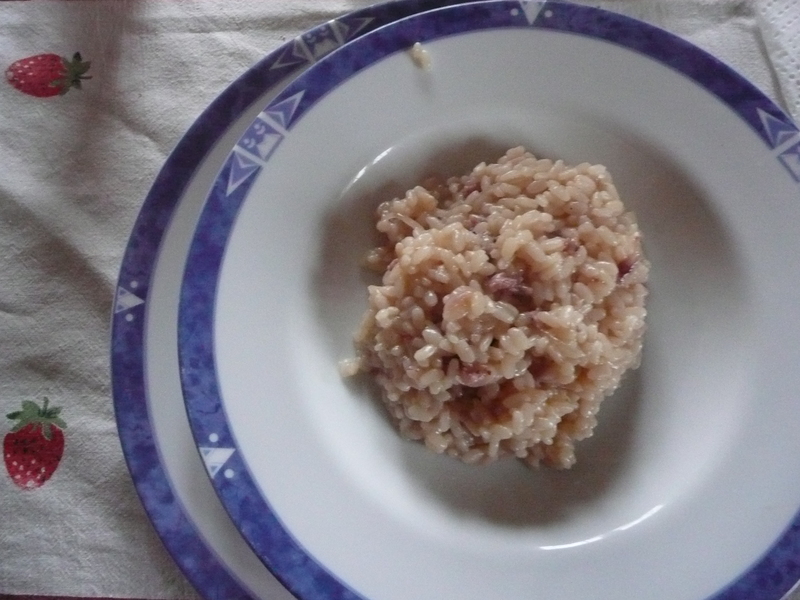 I also tried Marzemino, a local grape variety, for the first time (it was quite nice, but a bit spirity). 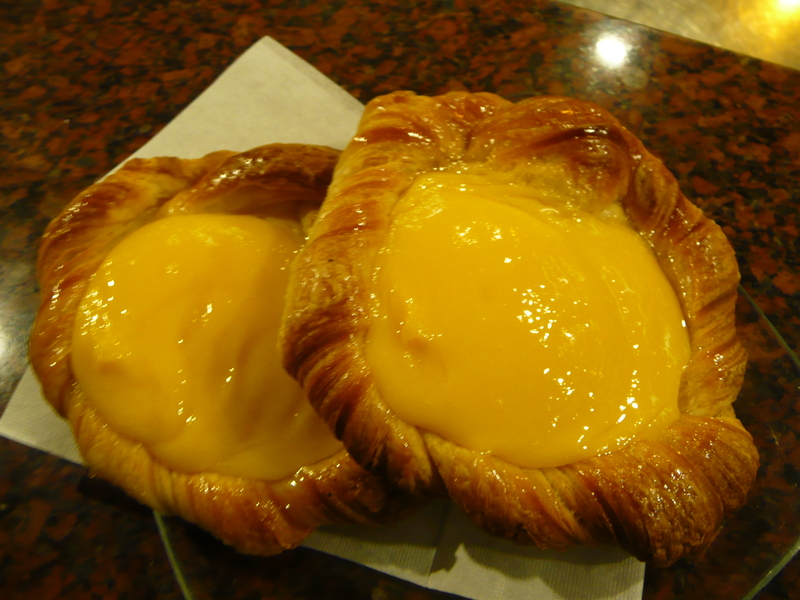 This morning after something of an ordeal at the post office (I don’t recommend posting parcels from Italy), we had bionde, a custard pastry, for breakfast. I also had the hot chocolate to end all hot chocolates – it was literally like drinking hot, thick chocolate mousse – perfetta! 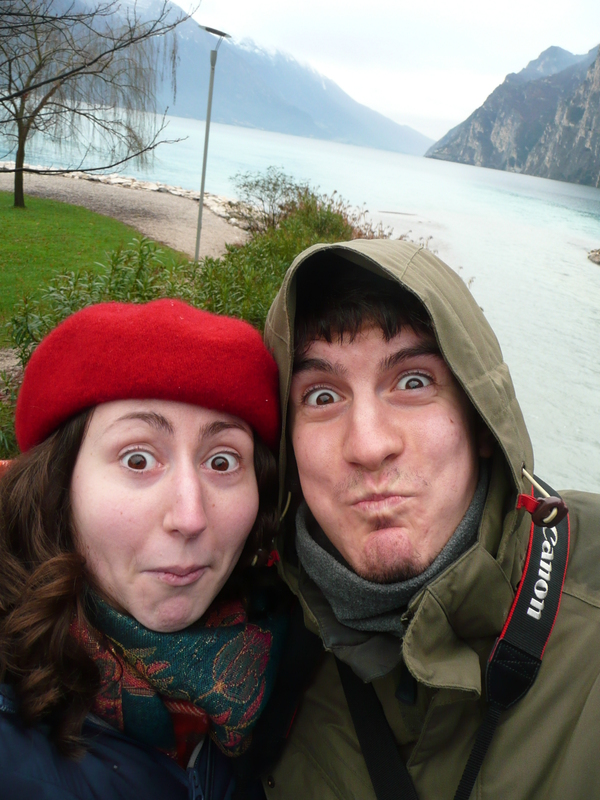 Today, after lunch at Katrin’s house, Patrick drove us to Lake Garda, the biggest lake in Italy. Not a bad way to spend Christmas Eve! The Lake is surrounded by stunning mountains, and the view is just spectacular. I took sooooo many pictures! 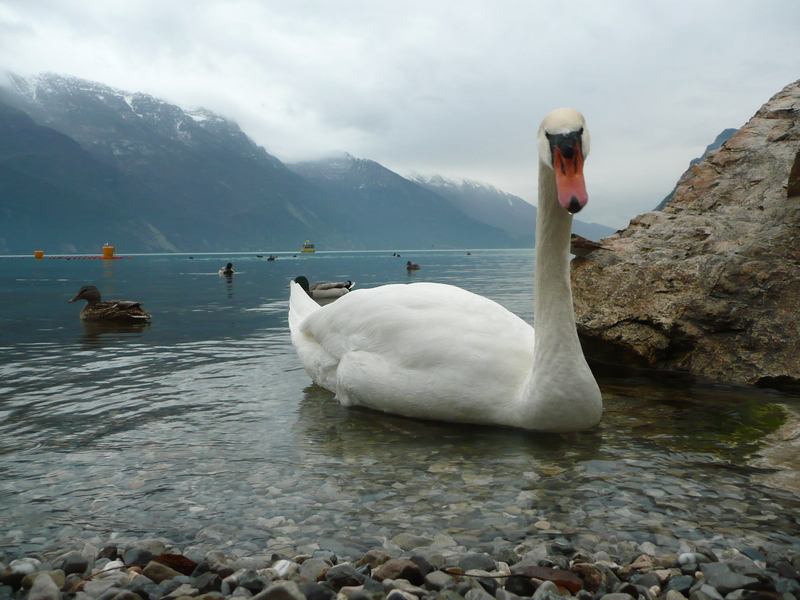 We even had 2 white swans come up close for their portrait shots! So I finally made it to Patrick’s in Italy! 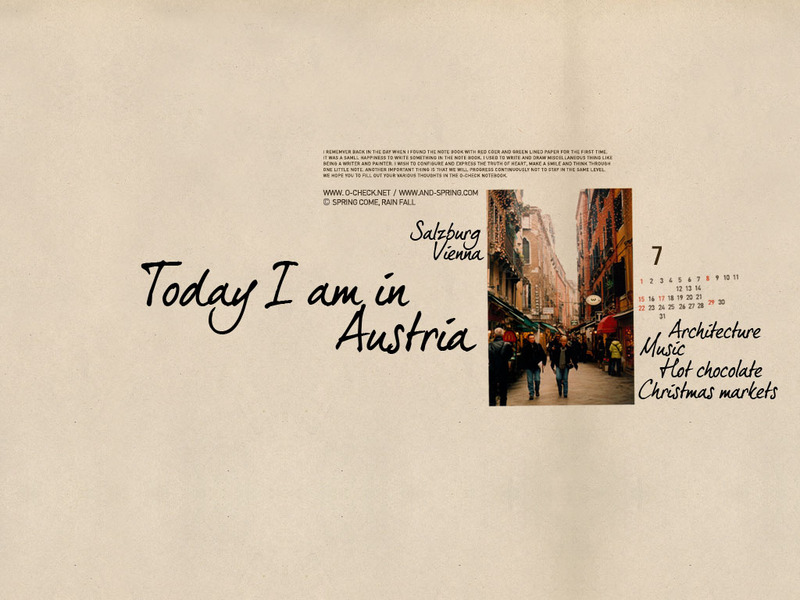 This past week has been so busy travelling with limited internet, so now I can post a bit about Austria. From Zurich, it took us nearly 6 hours by train to Salzburg, but the view was incredble! We loved the Alps, all coated in snow looking like something out of a fairytale, so the journey wasn’t too much of a hardship. And Salzburg itself is simply lovely! We had light snow when we arrived, and the city was blanketed in white. 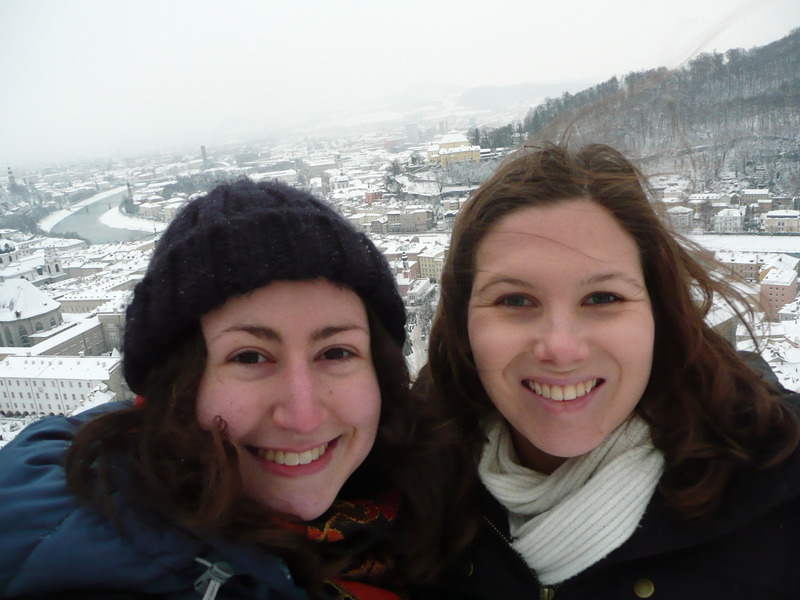 On our first full day we visited the Residenceplatz state rooms, and went up to the fortress overlooking the city. It was -6 degrees and our cheeks were pink from the cold, but the view was worth it! Our new joke is to try and speak ‘German’, which basically involves us saying ‘Jasmin/Sharon, now mit (insert random object here)’. E.g. Jasmin, now mit fortress! So we’re slowly learning! 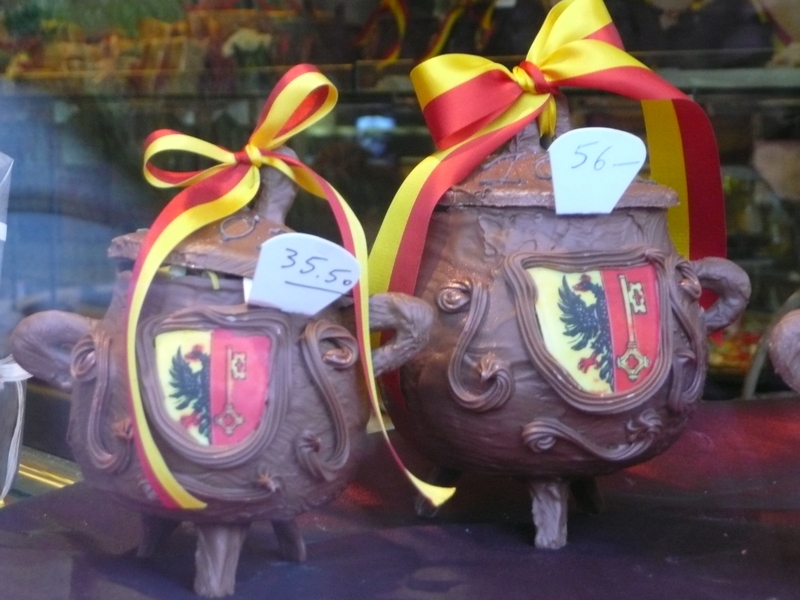 We also spent a lot of time at the Christmas markets there, where we heard carols and ate yummy food. Speaking of food, we found a great chain store called My Indigo which did delicious curries for 6 euros, so we ate there twice for dinner and once for lunch! The next morning we checked out and went to the old city to see Mozart’s birthplace. 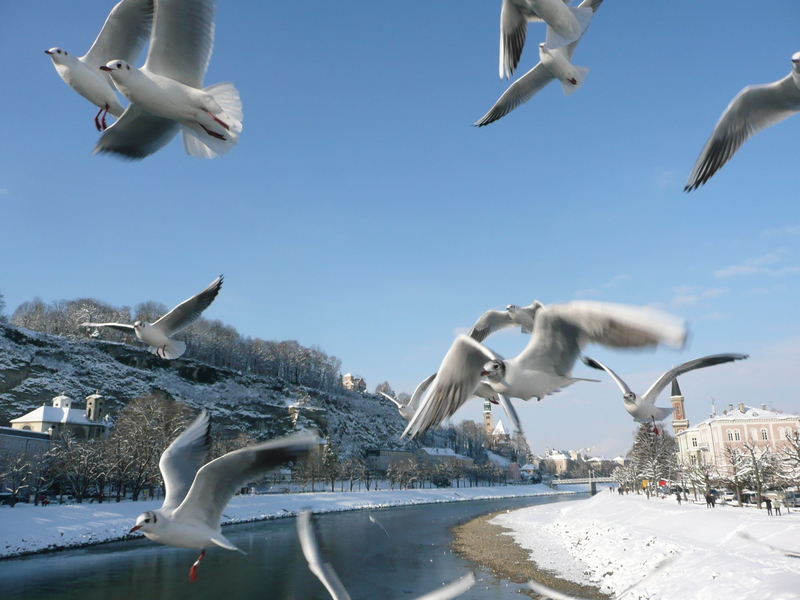 Jasmin pretended to throw food at the seagulls and I got this shot – talk about teamwork! Definitely one of the best from the trip so far. After seeing the Mozart house (and his original child-sized violin), we left for Vienna. Our train was unexpectedly delaye, so Jasmin organised new tickets for us and we eventually made it! Eva met us on the platform and we met Anna Maria for dinner at a local Chinese place (yum!). 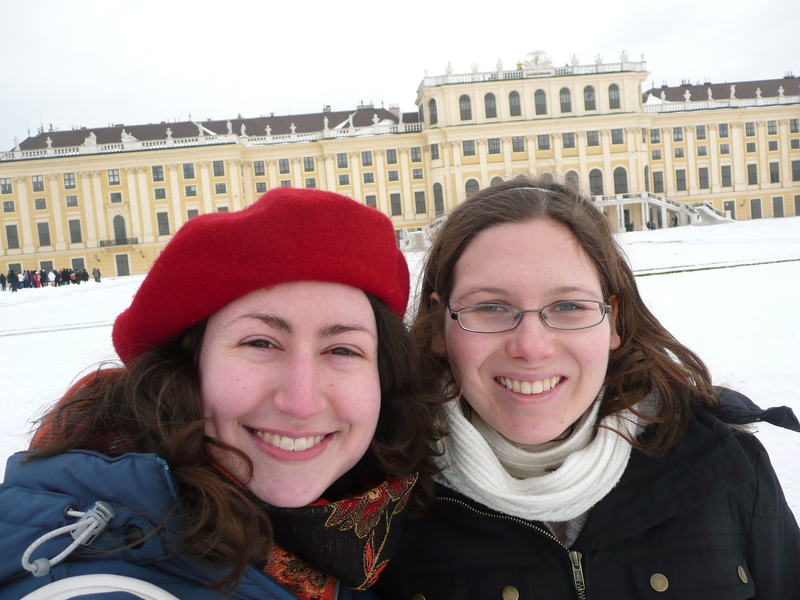 In the morning, Jasmin and I went to the Schonbrun Palace (another freezing cold day), and toured the rooms where Marie Therese had held court, and where Marie Antoinette had grown up. The gardens were stunning in the snow, but I have never been more cold in my life!!! 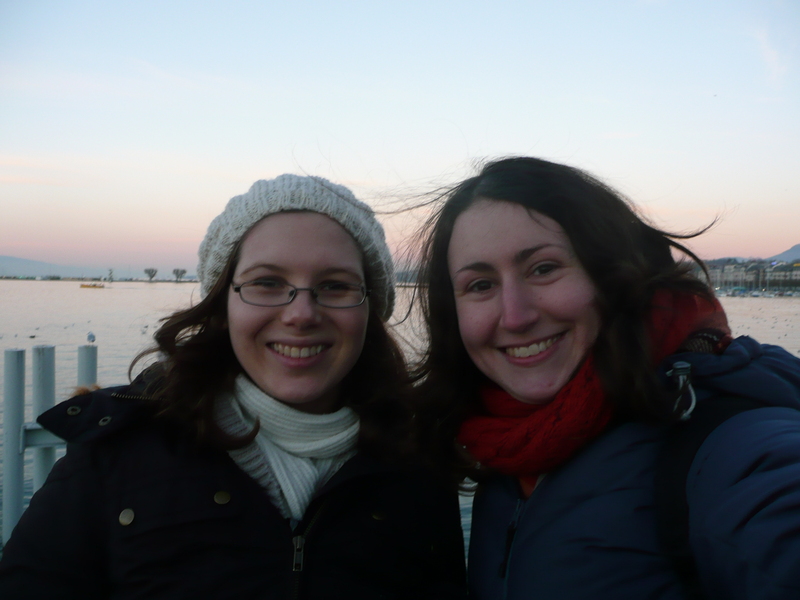 We were exposed to the wind, but took photos bravely! 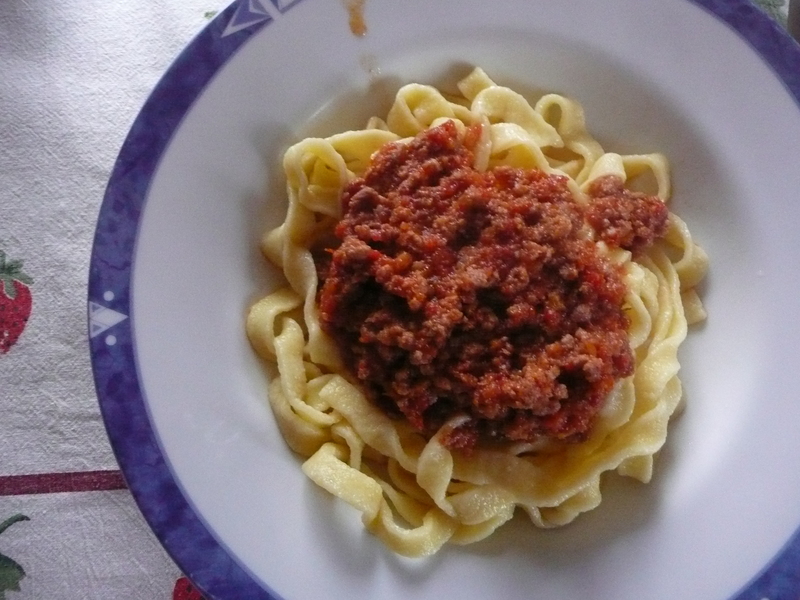 We met Eva and Anna Maria for lunch (Wiener schintzel! 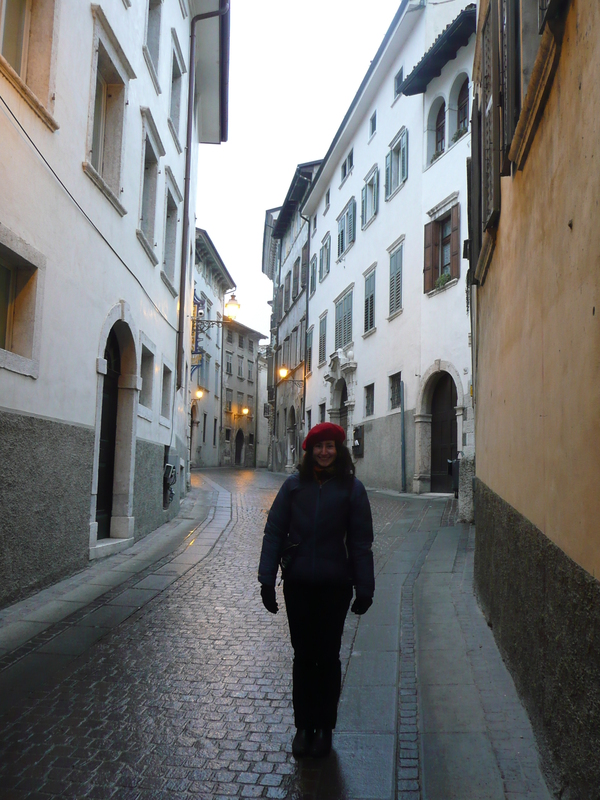 ), and by the time we’s finished it was dark, so we wandered around the city. We were amazed when the snow started to fall – it was exactly as I’d imagined snow, in clumps of little snowflakes that you could see! It was so perfect that we forgot about how cold it was and just enjoyed the beauty of it. We walked past the main cathedral in Stephensplatz, the Parliament and City Hall, where there was a huge Christmas market (which Jasmin and I went back to 2 days later). 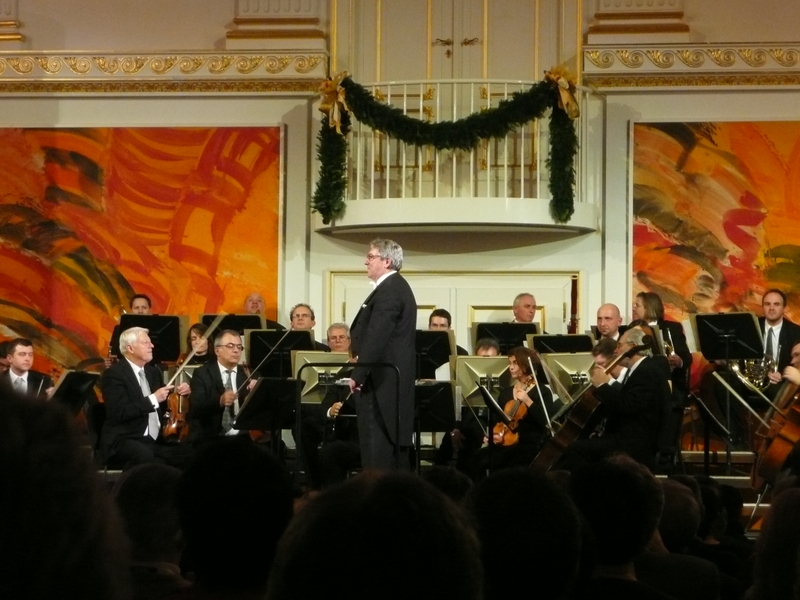 The second day was pretty much spent shopping (after moving Jasmin to a new hotel because her flight was cancelled), and in te evening we went to see the Vienna Hofburg Orchestra perform pieces by Mozart and Straus. They were so cool, making jokes with the audience, and at the end, we couldn’t get the Waltz of the Blue Danube out of our heads! Our last day was spent seeing the city sights by daylight, then having lunch which turned into dinner at Eva’s place with Karl (her boyfriend), Anna Maria and Suzanne (their friend who I’d actually met in Japan). We ate Kaiserschm… (I can’t actually remember the full name) and strudel (YUM), then spend the night watching Chaser’s on YouTube! 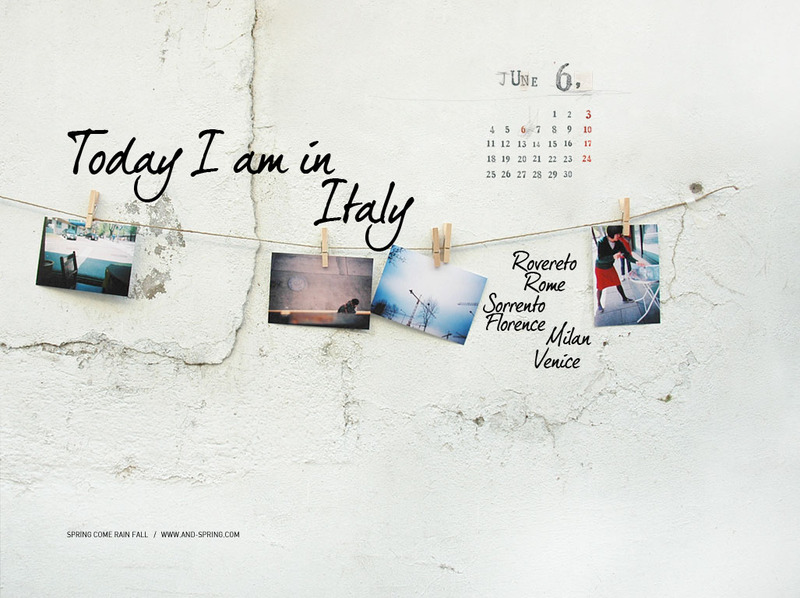 In the morning Jasmin and I went to the airport and said goodbye – she flew to London and I went to Milan, where I caught 3 trains to reach Rovereto! 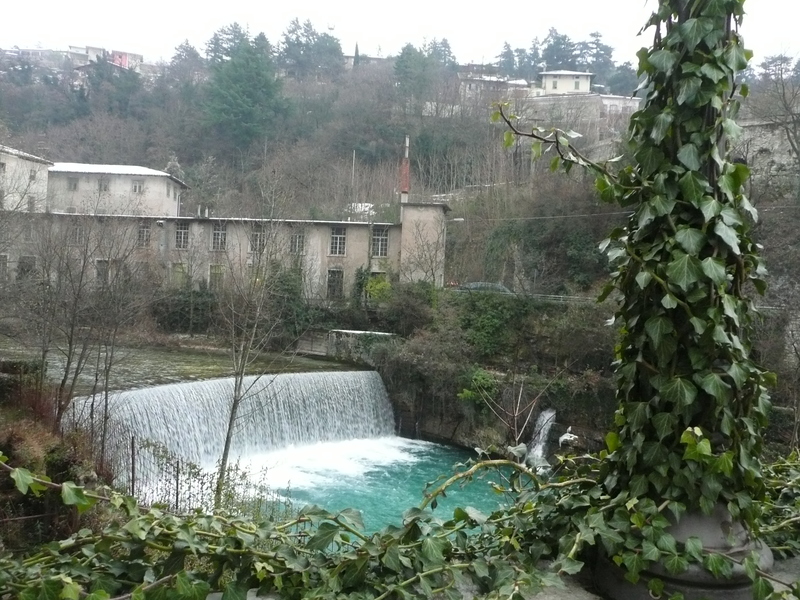 From what I’v seen, this is a beautiful place! It was soooo lovely to see Patrick again after all these years, and to finally meet his family. 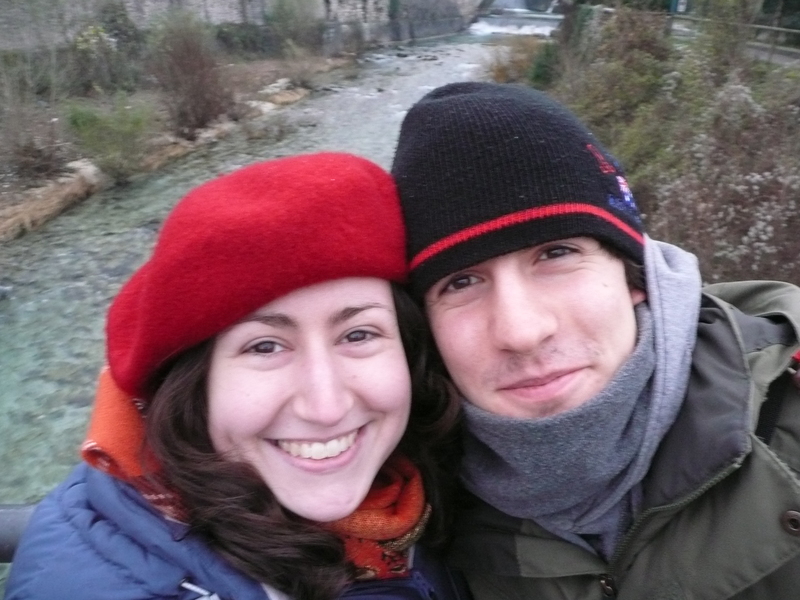 I saw the historical centre of the city today (it was raining but not too cold), and spent this evening looking at Katrin and Bruno’s wedding photos with them. It’s getting late so I’l put up a couple more photos and write again later. Night! Well, Jasmin and I are in Switzerland! 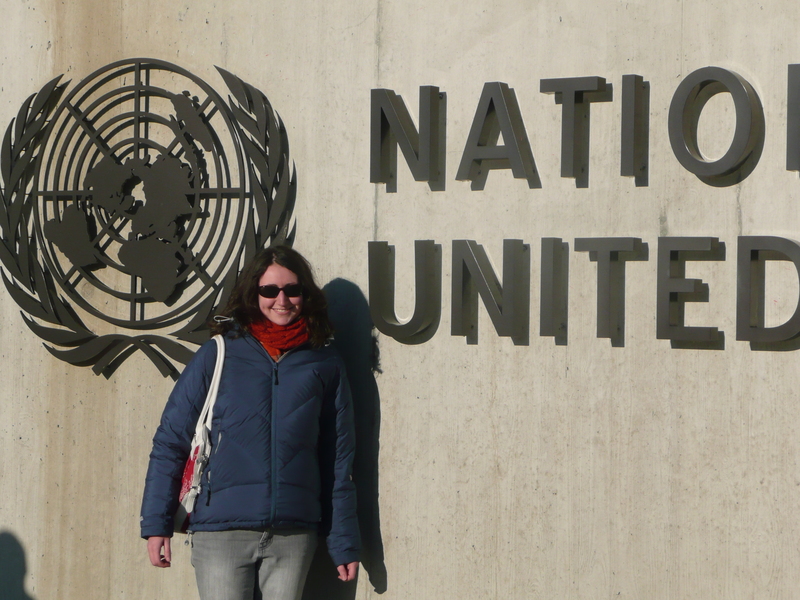 I got to Geneva yesterday afternoon, checked in, and, you guessed it, went to the UN! It was so cool to actually visit the Palais de Nations, which was once home to the League of Nations. 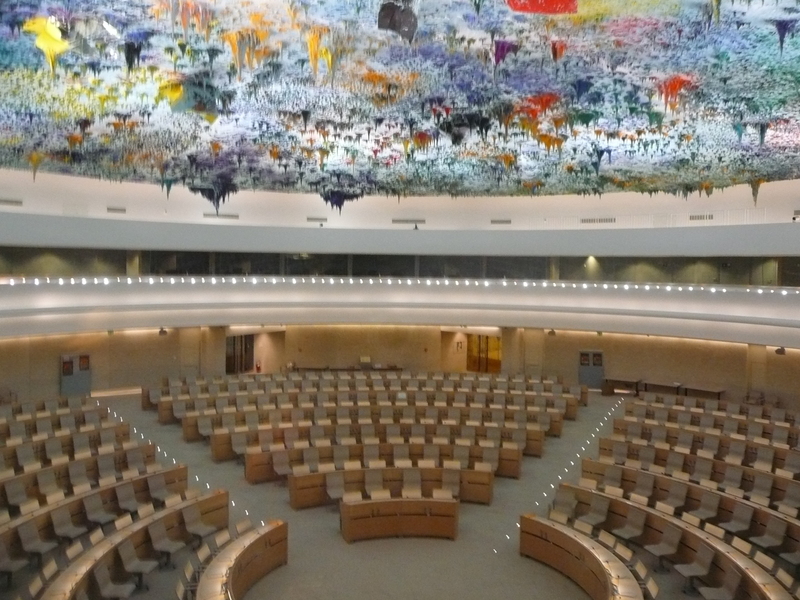 I took a tour and saw two amazing committee rooms (Human Rights Council and Disarmament committee), both with artwork by Spanish artists. I met two German sisters on the tour, one who was doing an internship in the UN office for sport, and they told me that I was in time for Geneva’s biggest festival, which was happening this weekend. I had no idea it was on, so I think we were just incredibly lucky with the timing! More about that in a second. I also visited the International Red Cross Museum while I was waiting for the UN tour (it’s just across the road). They have records of all the WW1 and 2 prisoners of war in huge cabinets, on index cards. It was a sober museum, but I learnt a lot. A highlight was seeing an original draft of the Geneva Convention, which was on display. It was dark by the time I was done, so I waited to meet Jasmin (who was flying in from Manchester). We went out for dinner at a Swiss place and had roestis, which were cheesy, but tasty. But before we went to the festival (which started around 2), we visited a flea market and picked up what are now our week-long trip mascots, The Russians. 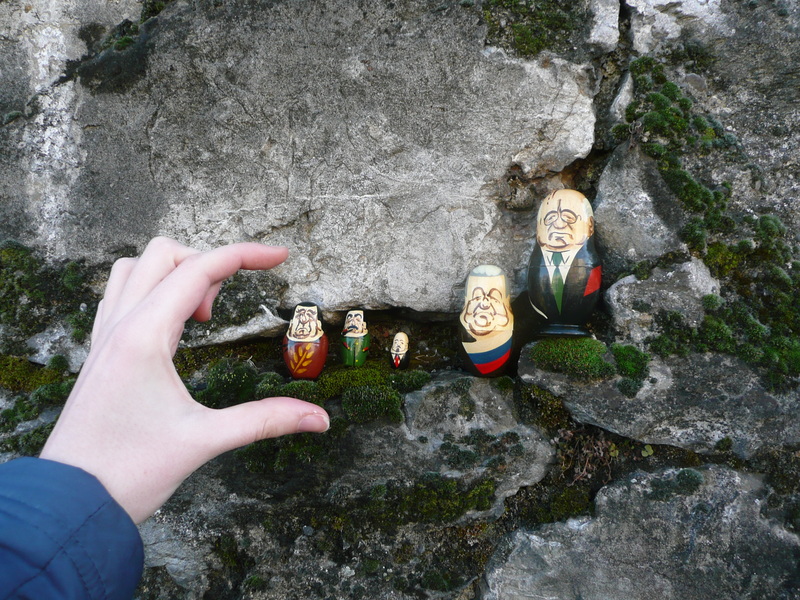 We found a matryoshka doll of Gorbachev, which has Brezhnev, then Khruschov, Stalin, and finally a teeny tiny Lenin inside. They have already had some adventures (Stalin tried to ”escalade” the Reformation Wall and Lenin was shot out of the jet d’eau), and will probably provide amusement for much of the next week. Right, so we went down to the Lake, and saw the flower clock, and the jet d’eau, which normally only operates in summer, but which was on for the festival. We grabbed a quick lunch, then went back into the Old Town for some festival fun. 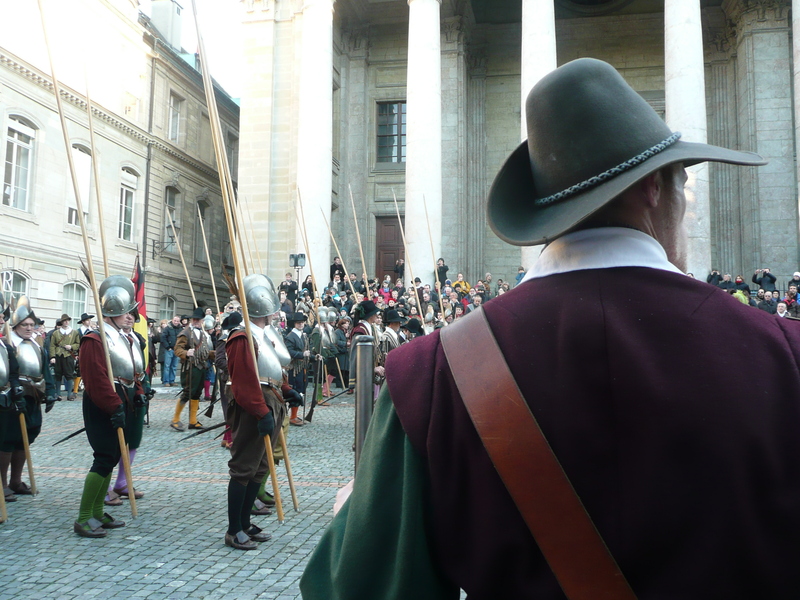 We began by following guys dressed in 17th century clothes holding muskets to the square in front of Saint Peter’s Cathedral, to see (and hear, boy could you hear it!) a live cannon and musket display. We also saw a trumpet troupe perform in the Catherdral, and groups of drummers and flautists playing in the street. There were men on horseback prancing around and no matter where you walked in the Old Town, you could hear music and occassionally the sound of cannon fire! We drank spiced hot apple juice and ate apple tart, then watched a blacksmith’s display (making a sword and horseshoes). The whole atmosphere was amazing, with kids dressed up running around and Scout groups with their woggles playing games, people eating and laughing. I really really enjoyed the whole thing! Once we’d seen pretty much everything, we headed back to the Lake, and saw the most spectacular sunset! It was like stepping into a watercolour painting, especially with the Alps all around. 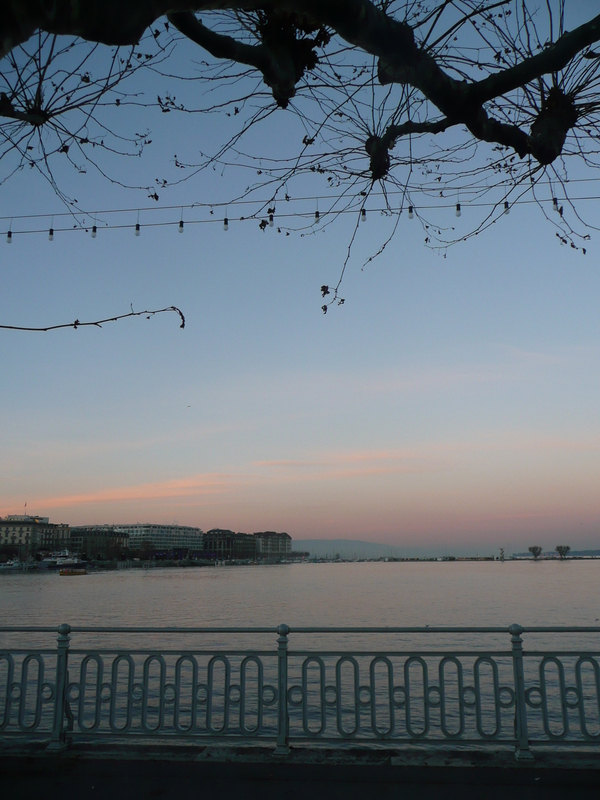 We walked back to the hotel, relaxed for a bit, then went back out for dinner, as well as to check out the night lights on the lake. 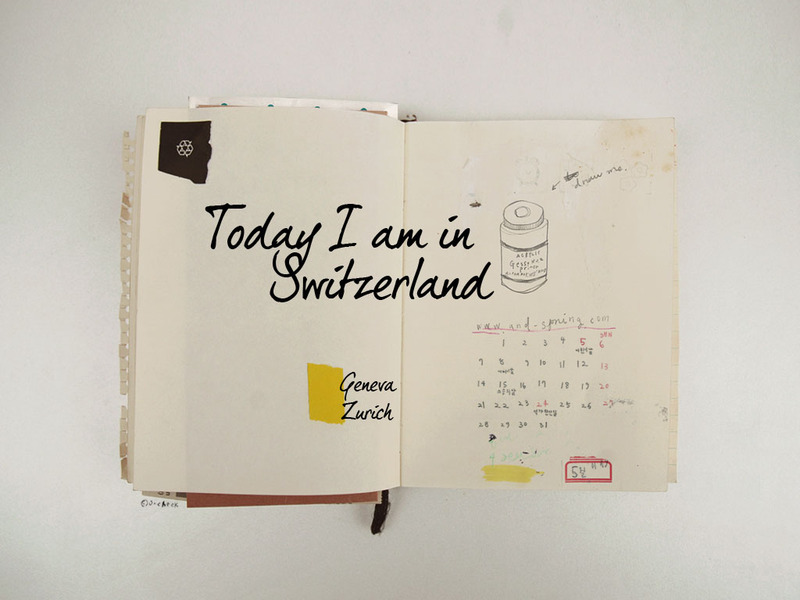 Tomorrow we’re off to Zurich, but might spend the morning looking around a bit more first. It has been a fantastic day, especially since we were so lucky in coming across the festival!